Over 100 individuals came out with their pets-- which ranged from hermit crabs and mice to dogs and goats-- for the traditional Franciscan blessing during the second annual “Blessing of Animals” at St. Margaret Mary Church Sunday, September 30, 2012 in Algonquin. 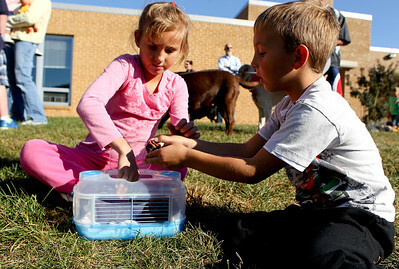 Mike Greene - mgreene@shawmedia.com Christina Beyer, 7 of Algonquin, and her brother Kevin, 5, put their hermit crabs back into the cage before the start of the second annual “Blessing of Animals” at St. Margaret Mary Church Sunday, September 30, 2012 in Algonquin. Over 100 individuals came out with their pets-- which ranged from hermit crabs and mice to dogs and goats-- for the traditional Franciscan blessing as well as a raffle for small prizes. Mike Greene - mgreene@shawmedia.com Cinsy Cimaglio watches as her son Zach pets their dog Lucy during the second annual “Blessing of Animals” at St. Margaret Mary Church Sunday, September 30, 2012 in Algonquin. Over 100 individuals came out with their pets-- which ranged from hermit crabs and mice to dogs and goats-- for the traditional Franciscan blessing as well as a raffle for small prizes. 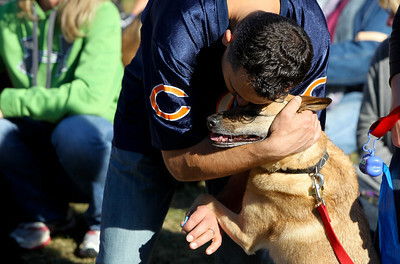 Mike Greene - mgreene@shawmedia.com Pete Kotowski-Castiglione, of Algonquin, embraces his dog Nema during the second annual “Blessing of Animals” at St. Margaret Mary Church Sunday, September 30, 2012 in Algonquin. Over 100 individuals came out with their pets-- which ranged from hermit crabs and mice to dogs and goats-- for the traditional Franciscan blessing as well as a raffle for small prizes. 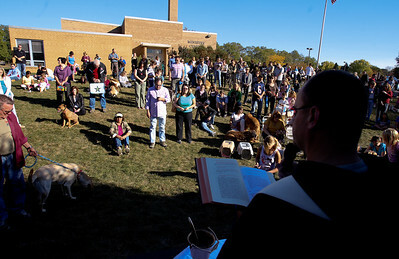 Mike Greene - mgreene@shawmedia.com Community members listen to a blessing during the second annual “Blessing of Animals” at St. Margaret Mary Church Sunday, September 30, 2012 in Algonquin. Over 100 individuals came out with their pets-- which ranged from hermit crabs and mice to dogs and goats-- for the traditional Franciscan blessing as well as a raffle for small prizes. 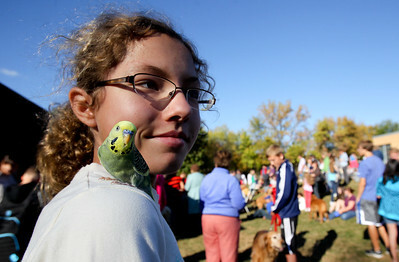 Mike Greene - mgreene@shawmedia.com Victoria Mankowski, 11 of Crystal Lake, looks around the crowd as her rare parakeet Rio perches on her shoulder during the second annual “Blessing of Animals” at St. Margaret Mary Church Sunday, September 30, 2012 in Algonquin. Over 100 individuals came out with their pets-- which ranged from hermit crabs and mice to dogs and goats-- for the traditional Franciscan blessing as well as a raffle for small prizes. 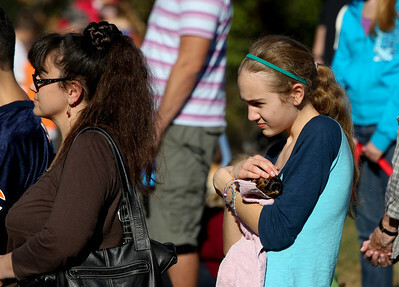 Mike Greene - mgreene@shawmedia.com Katherine Kotowski-Castiglione, 13 of Algonquin, holds onto her guinea pig Coco during the second annual “Blessing of Animals” at St. Margaret Mary Church Sunday, September 30, 2012 in Algonquin. Over 100 individuals came out with their pets-- which ranged from hermit crabs and mice to dogs and goats-- for the traditional Franciscan blessing as well as a raffle for small prizes. 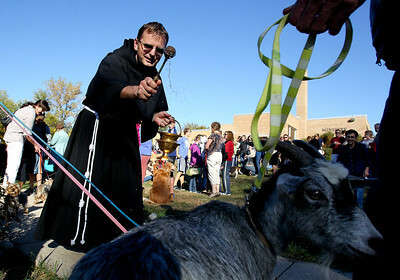 Mike Greene - mgreene@shawmedia.com Father Andrzej Brzezienki of St. Margaret Mary Church blesses goats owned by the Brandt family of Barrington Hills during the second annual “Blessing of Animals” at the church Sunday, September 30, 2012 in Algonquin. Over 100 individuals came out with their pets-- which ranged from hermit crabs and mice to dogs and goats-- for the traditional Franciscan blessing as well as a raffle for small prizes. 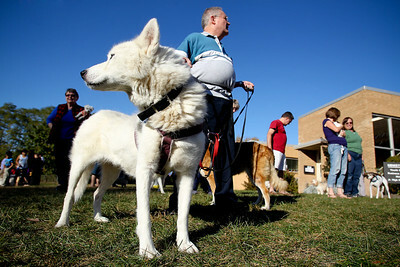 Mike Greene - mgreene@shawmedia.com Arianna, a siberian husky, watches one way as her handler Ed Church, of Algonquin, watches the other following the second annual “Blessing of Animals” at St. Margaret Mary Church Sunday, September 30, 2012 in Algonquin. Over 100 individuals came out with their pets-- which ranged from hermit crabs and mice to dogs and goats-- for the traditional Franciscan blessing as well as a raffle for small prizes.